1. This is part of a marked out cycle route – recognisable by the green bicycle with the arrow. 2. 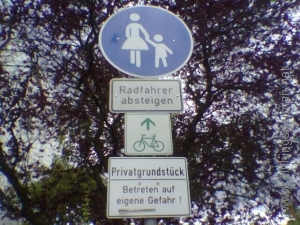 But it’s for pedestrians only – see the white mother and child on a blue background. 4. 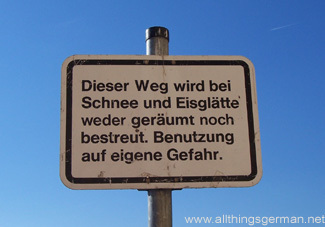 Oh, and it’s private property anyway – “Privatgrundstück”, but you can still push your bicycle across it at your own risk – “Betreten auf eigene Gefahr!”.